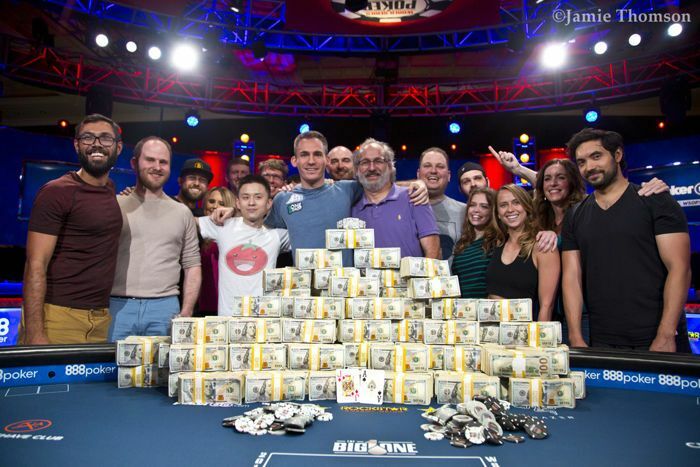 Coverage of the $1,000,000 buy-in The Big One for One Drop is brought to you by Global Poker. Daniel Negreanu tweeted that it was time for him to stop hanging onto the top spot on the all-time money list. That torch has been passed as Justin Bonomo ascended to the throne with a $10 million win in Event #78: $1 Million Big One for One Drop. Bonomo now has just under $43 million in cashes, leaving Negreanu ($39,656,197) and Erik Seidel ($34,575,437) in his dust. Bonomo called it "awesome" to be the top all-time tournament money winner but said the accolade doesn't hold as much meaning to him as his assessment of his own play. And while results in poker can lie, the incredible $25 million — and two bracelets — that Bonomo has acquired in 2018 alone reflect what Bonomo feels has been some of the best play of his decorated career. "At the end of the day, I feel like for the past year I've played absolutely fantastic poker," he said. "I'm not going to say I'm the best player in the world but I'm very confident that I'm up there." Coming into the event, Bonomo said friends had asked him how excited he was to play One Drop, the high roller of high rollers that sees hundreds of thousands of dollars go toward access to clean water for those in need. Bonomo admitted he was anything but, though. "It's a great privilege but I see it as a great responsibility," he said. "It's more money than I've ever played for in my life." Befitting that, Bonomo prepared harder and with more focus than he has for any other event. He studied for hours, including the entire day before the tournament started. He studied some more on breaks. He meditated daily. "I'm not going to say I'm the best player in the world but I'm very confident that I'm up there." Coming into the final day, the bubble loomed with six players left but it wouldn't last long despite the monster $2 million difference between going home empty-handed and cashing. 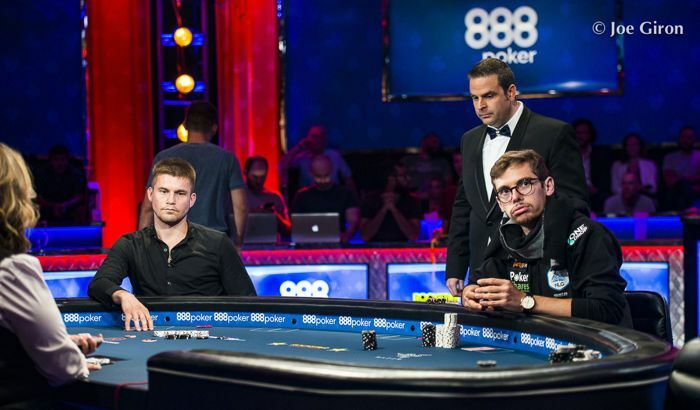 Wealthy investor David Einhorn doesn't need to sweat such a bubble like most of the other One Drop participants, so he got his chips in early on when Bonomo check-raised him after flopping top pair of sevens and bricked the turn and river with overcards. Given that Einhorn donates all of his winnings to charity, Bonomo said he couldn't help feel but a little conflicted when the river card confirming his win came down. "To be totally honest, I almost feel guilty for knocking out David Einhorn," he said. "I will give a lot to charity but I'm not as well off as him to give it all to charity. It's an honor to be part of the money that's donated to One Drop." Right after that, a huge pot developed when Byron Kaverman shoved for 8 million at 300,000/600,000/600,000. Fedor Holz called, and Rick Salomon reshoved for 26.9 million. Holz found the call button with tens — after Salomon's ace was exposed — and found himself in a good spot against ace-king of hearts held by Salomon and ace-five of clubs shown by Kaverman. The flop brought top two for Salomon but the turn gave Holz a gutter and Kaverman a flush draw. A ten of diamonds river meant a double knockout. Holz struggled with the decision but called and knockout out two players. 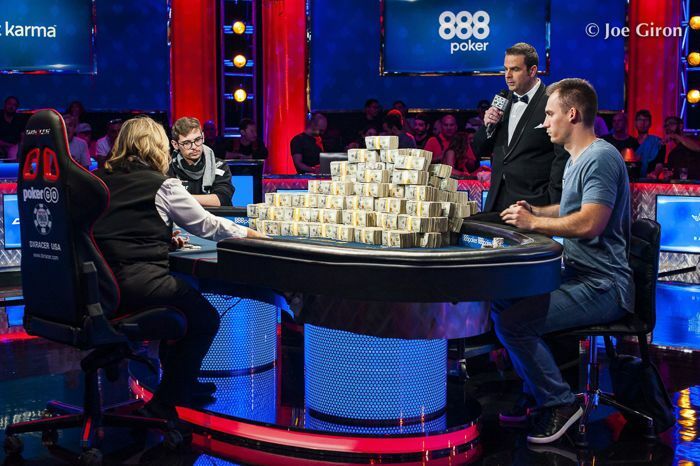 Three-handed poker for millions of dollars commenced between a fitting final three: Bonomo, Holz and fellow high roller Dan Smith. Holz had surged into the lead and took control of about two-thirds of the total chips. Bonomo, after coming in with a sizable lead, was reduced to the short stack and about 20 big blinds. However, he'd climb back up and bust Smith with king-ten against queen-ten suited in the blinds. A bit of a rivalry has developed between the two combatants left heads up. Holz, of course, put together arguably the greatest run in the history of tournament poker in 2016 when he won $16 million, the measuring stick by which all recent streaks have been compared and found wanting until Bonomo's binge. Furthermore, Bonomo busted Holz in a much-discussed Super High Roller Bowl hand that contributed greatly to the former's eventual $5 million victory. Holz versus Bonomo, the match the fans wanted to see. "I enjoyed seeing the tweets," Bonomo said with a laugh. "They wanted to see the true heat test: who is the luckier player, myself or Fedor? "Almost everyone out there respects the game of both myself and Fedor. I certainly respect his game a great deal. It definitely felt like a storybook ending playing against Fedor with him starting with the chip lead and having to grind my way back." "They wanted to see the true heat test: who is the luckier player, myself or Fedor?" After Bonomo won a flip to find some footing heads up, the key pot developed as Bonomo three-bet the eight-four of diamonds and turned two pair. He checked after betting the flop and Holz barreled off with a king-high airball, with Bonomo snap-calling the river to double into a big lead. Holz got it in behind twice and scored lucky doubles, but third time was the charm for Bonomo when ace-jack was superior to Holz's ace-four. Bonomo said he felt a combination of disbelief and happiness after the final card hit the felt. The latter is understandable but given the phenomenal run he's put together, he may be the only one on earth who felt the former. He doesn't plan to give his opponents any reprieve, either. After some much-needed time off after what he called a "grueling" grind in recent months, Bonomo plans to get right back to business as usual. "I don't feel that I have anything left to prove to anyone." "I don't feel that I have anything left to prove to anyone," he said. "I'm going to continue what I'm doing: playing tournaments to the best of my ability and studying and getting even better. I'll never be complacent with my poker game." For now, he can put away the emotion-less gaze he wears at the felt and enjoy $10 million and the title of winningest player in poker tournament history. He dedicated the win and promised the bracelet to his father after years of giving all of his trophies to his mother, and he's ready to relax and enjoy a night out with the dozens of people who cheered him to victory. "I'm so looking forward to partying with all of these people that I love so much tonight," he said. Justin Bonomo celebrates the win with family and friends.